Okay. Since I’m sure I’m not the only one who likes to look at random funny videos online, I thought I might share this. There are a few words to describe this video, like strange, funny, and downright addictive. I’ve watched it three times now in less than ten minutes, since I keep replaying it to show a few of my fellow pokemon fans. My brothers laughed, and now they want to buy his Pikachu costume. It’s clever, witty, and cute…with a bit of ‘What is he doing?’ in it. 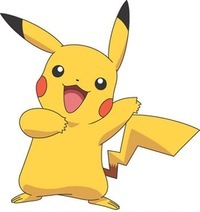 You know you always try to catch a pikachu in every pokemon game you have ever played. It’s almost a must, and Pokemon Yellow is still one of my favorites among the series. The reason? Because Pikachu followed me, of course! I was just like Ash in the cartoon! For those of you who don’t really know pokemon…well, that should have still made you laugh.